Snoring hummingbird. Snoring hummingbird. Snoring hummingbird. We love this snoring hummingbird! 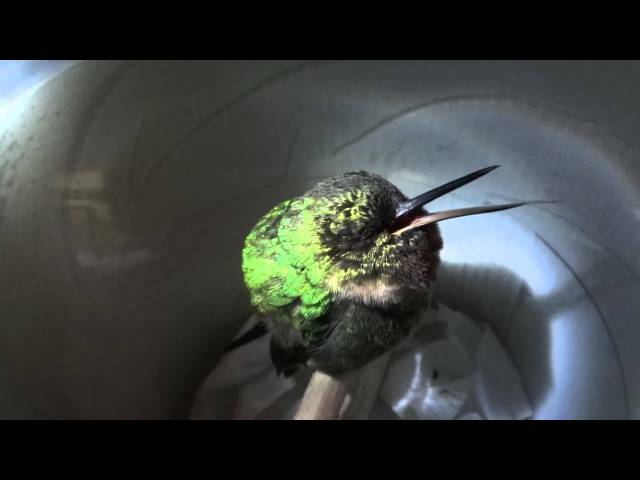 This mesmeric video was recorded by scientists in a Peruvian lab who were studying the sleeping patterns of hummingbirds. Hummingbirds have an exhausting life – in order to “hover” they have to beat their wings between twelve and eighty times per second. To achieve this they don’t bother having insulating feathers, like other birds, which means at night they can get very cold. To overcome the night time shivers hummingbirds deliberately lower their internal temperature and slip into a kind of temporary hibernation. In the mornings it can take hummingbirds up to 20 minutes to fully wake up from this deep sleep – they do this by gradually taking in increasing amounts of oxygen, which in turn, increases their body temperature. It is this gasping for oxygen that causes hummingbirds to make this cute “snoring” sound.